I haven't been interacting with Mail for half an hour, but suddenly it opens its main window in split screen with the fullscreen video player that I'm watching. This happens every other day. I can't really say if this only happens when Mail is running, since it's hard to check that after the fact. Assuming it only happens when Mail is running, can something be done other than making the habit of always quitting Mail as soon as possible? Is there some hidden feature triggering this? I've been having the exact same problem for a while - particularly interesting while I'm trying to watch netflix! I found a checkbox option in the Mail->Preferences tab which says "Prefer opening messages in split view when in full screen" (see screenshot). I've unchecked that so here's hoping it solves the problem! If it doesn't, I've seen a few other posts about this suggesting that the fact that it pops up at all is something to do with Google Calendar if you have any Google accounts assigned to your mailboxes. See if this link helps you if so! Not the answer you're looking for? Browse other questions tagged macos mail.app mojave fullscreen split-view . Application Exposé with fullscreen window? Is there a way to combine two fullscreen windows into a split view window with Automator/AppleScript? 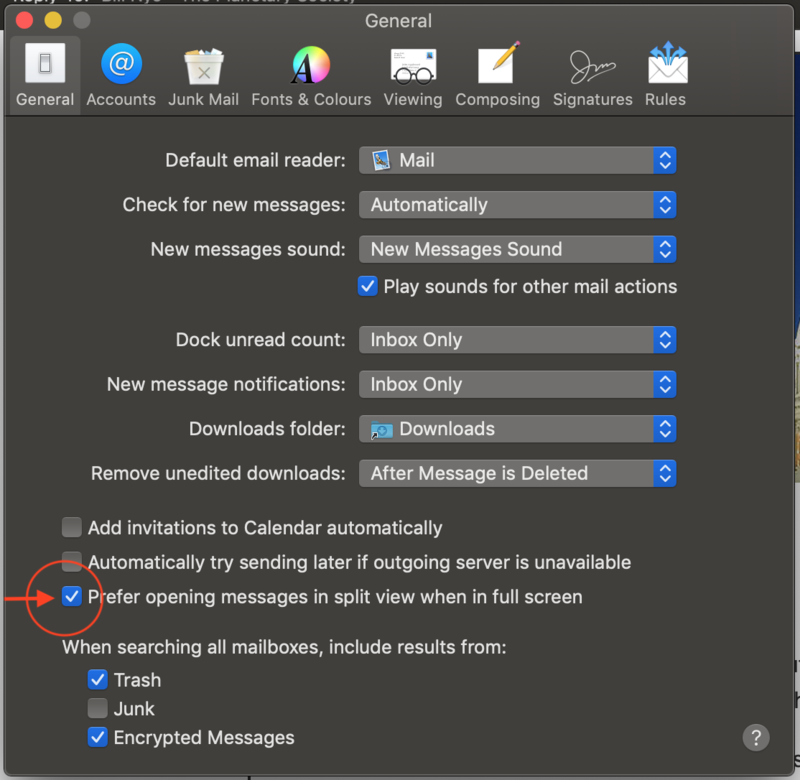 How to make Mail not to open it's window automatically? Split screen divider stuck on Desktop, not actually dividing any windows, distracting - how to remove?